This little sculpture doubles as a trinket dish~ rings or a bracelet can be put safely in the pool. 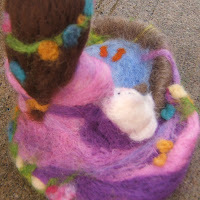 Needle felted with corriedale and merino and YAK~ yes yak~ The brown is all yak fiber (cool, huh?! 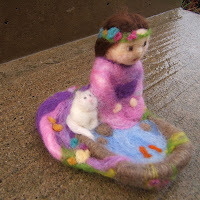 ), this little sculpture was a fun experiment in making a person as well as trying out some ideas and different styles of felting. Faces scare me. I mean, making them scares me (not scares me like freaky mascots scare me *shiver*)~ whether painted or felted or drawn, they i ntimidate me. I am happy with this one, though the nose gave me some trouble. 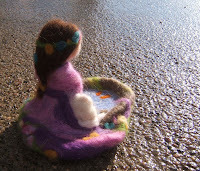 I was so pleased with the effect of the dress due to the very pretty multihued violet/ pink roving. Wow - what a beautiful creation. I know very little about felting, but your little lady is so sweet. I also read your post about the funeral. You sound like a warm wonderful person. That is so sweet! I also like your tree huggers! you shouldn't be intimidated, your really good! Such a delicate project...she's beautiful! I can't imagine the creativity and patience this took! Very pretty - the pose, the color an the face.